Is it annoying to post salad recipes back to back? I’m sorry, but I’m doing it anyway. You can stop reading right now if you don’t want any more salad. I totally get it. It’s the middle of winter. You want hearty fare that requires turning on your oven…and maybe even using a meat thermometer. The thing is, my salad blitz is kind of a farce. Yes, I’ve been eating salads, but they’ve been relegated to understudy status. Lots of unhealthy comestibles have been my featured stars as of late, mainly cheese, french fries, and peanut M&Ms. I’m telling myself it’s just that time of year. But, you know what? I’m over it! I’m over putting so many happenings-of-late into the it’s just that time of year bucket. I’m kicking that bucket to the curb. See ya, it’s just that time of year bucket! Wouldn’t want to be ya. This salad is crisp and colorful and has a zingy tart from the parsley and preserved lemon. 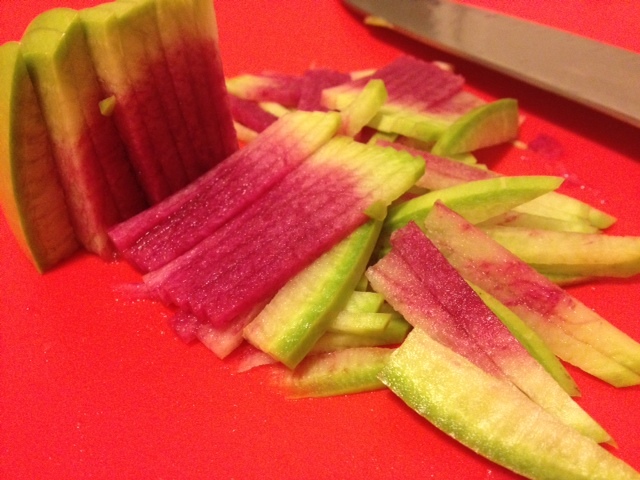 The watermelon radish is a marvel. Every time I slice into one, I experience sheer disbelief. Come on! This is nature?! It grows in dirt?! Watermelon radish, you are a tiny miracle. That’s what I think. Every time. 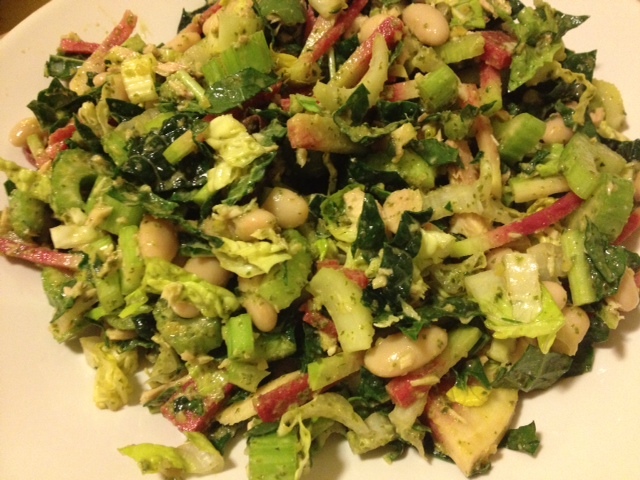 The white beans add creaminess, the celery adds crunch and the tuna gives it a protein punch. You’ll like it. And it goes well with heartier things like soup. You can (and should) have both…anytime of year. 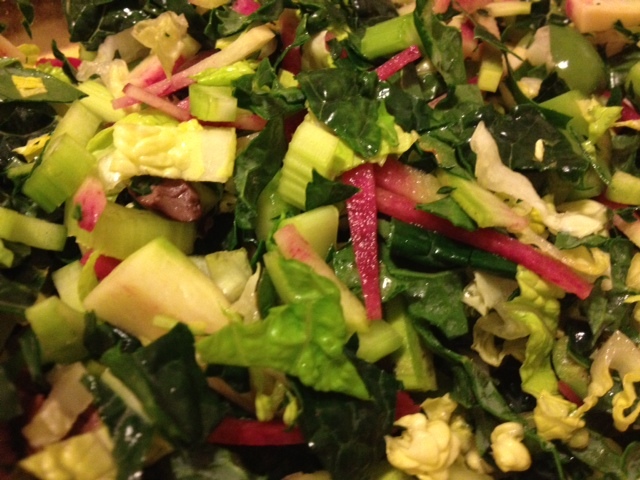 Toss the celery, olives, radish, kale, and romaine together in a large salad bowl. Add the beans, tuna, preserved lemon, and gently toss again with your hands until well mixed. Season with salt and pepper and toss with the parsley vinaigrette. Pulse parsley, olive oil, lemon juice, vinegar, and garlic in a food processor until well blended. Season with salt and pepper. You can eat this salad right away, but it’s even better if you let it hang out in the fridge for an hour or so to allow the flavors to meld in magical ways. We will be making this in the McIntyre/Helsell house sometime next week.